Yesterday I had expected to return from shopping at Home Depot with the flooring for my living quarters. However, I was unable to find flooring that I liked. 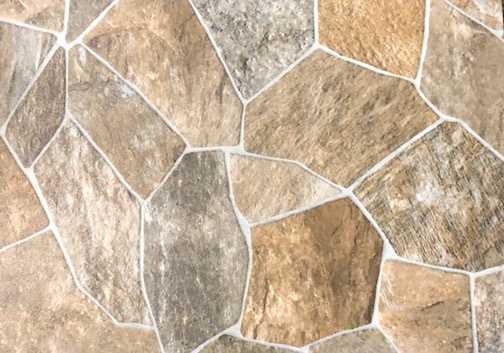 Home Depot appears to offer only very inexpensive [Cheap] vinyl flooring. This means that I will be able to install my living quarter's raised floor with the insulation and underlayment. But I will not be able to proceed with framing the walls and ceiling until the vinyl flooring is installed. I'll be searching online today for local flooring shops that may have what I am looking to buy. This Blog post is coming from Starbuck's. This Starbuck's is in the same shopping center as 24-Hour Fitness Balboa. I have gotta keep working out regularly because I feel so much better when I do! You may know that I have been sleeping on my mattress which is on Box Van's floor during nite time. When I am working out regularly, it is so much easier for me to get to my feet from lying on that mattress. I have learned that keeping in shape at my age is sooooo essential. Doing this construction is putting demands on my body. And I must be able to do this physical stuff in order for me to complete Box Van on my own! La Mesa Flooring Company is an old-time outfit. That's two years before me! On display inside the store, there are tons of vinyl samples for customers like me to choose. The samples are in books. Each book from a different flooring manufacturer. I went thru each book and placed a sticky-note on each page that was promising. Then, when I had gone thru all of the books, I reviewed the samples with my sticky notes. 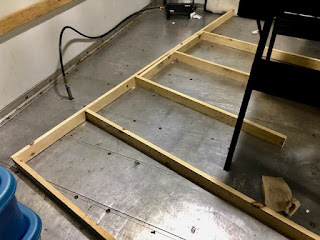 After supper, I began making the parts for the raised floor. The pic below shows how the frame looked just after connecting some of the floor joists to the rim joist. The floor joists in this pic are on 16" centers. The floor frame is made from 1 x 3 common board. Lowe's caries stick on floor time. might be a good choice. Did you read my 1:45 pm Blog post today? I've made my choice. I have not shopped Lowe's for vinyl flooring. But I have shopped Home Depot and found the flooring sold is very low quality. I paid $3.39/square foot for the Armstrong vinyl that I purchased. That price got me what I wanted. I assumed you were going to lay those sleepers flat and secure then to the van's floor, with 3/4' foam insulation fitting perfectly in between. How do you plan to secure them so they don't slap and make noise when walking on them? Box Van's floor is aluminum. That aluminum would need to be drilled and tapped in order to secure the sleepers. And the aluminum is not sufficiently strong for this application. Instead, the living quarters' walls will be secured to wood hold-down runners installed by U-Haul for securing furniture being moved. These runners are designed to be strong. The sleepers will be pressed firmly to Box Van's floor by the weight of the entire living quarters structure. I suspect you'll be hearing a "clunk" "clunk" noise as the floor joists bounce in the center when you're walking on them. Personally, I would have laid them flat as true "sleepers", glued to the floor, with 3/4" foam board in between, then plywood underlayment also glued down. This would provide plenty of insulation and a more bounce-free floor. If I hear a clunk from floor joists, I shall come here on my Blog an declare that you were right and I was wrong. Also, this is not an either/or situation. If I come to feel that the raised floor would perform better by being fastened to Box Van's floor, I will do that! So, you are predicting that these sleepers will rock while under the weight of my entire living quarters structure. Hmmm where is Mr. Ed when we need him? !